Talisman – an object held to act as a charm to avert evil and bring good fortune. The revelation to the American public that its establishment media is biased, lazy, and protective of their turf surely by now must extend to the Augusta contingent of “recognized” media. After all, activists brandishing Georgia Open Records Requests and publishing their own stories reinforced by documents offering obvious proof got too big to ignore between 2011 and 2013. By 2014, you might think their “professional” inquisitiveness would have taken hold, but the Metro Spirit took resolute opposition to perceived competition to extremes. When the reformers started investigating the Reynolds Street Parking Deck boondoggle the Metro Spirit cover was one of black helicopters over the deck. Somehow, they later were acknowledging the discovery of liens on the property under the parking deck as common news. There is no way they would admit that the City Stink blog systematically awoke Augusta to such a ridiculous circumstance without THEM! The exception was Metro Spirit Writer and radio talk show host Austin Rhodes occasionally would provide some coverage to the alternative media, most recently with the absurd Tractorgate Scandal that saw Augusta men and Equipment secreted three counties away for work on private property of an ex-Augusta contractor. The Columbia County Commission meeting of May 6, 2014 was covered by Spirit reporter Eric Johnson, who promptly disregarded the directly presented challenge to then Finance Committee Chairman Ron Thigpen’s bonus with Georgia Bank and Trust. That bank was awarded a highly irregular mass banking deal with the county, with Thigpen recusing himself from the commission vote. Instead Johnson decided to interject his own bias and implied that the real subject was instead Chairman Ron Cross, then up for reelection. The acknowledgement of all of our enhanced “time and attention on this stuff” was very true, however. He even got handed key documents in the hope that he would pick up on the story. No way Jose. Astounding. Georgia was number one in mortgage fraud in the USA for 5 years from 2000 to 2004, leading to a tsunami of bank failures in 2008 through 2010, losing 1/5 of the state’s banks, yet NOBODY can come to suspect any alligators in their local banking swamp. The “media” ad sales blindfold “reporters.” “Their” advertisers cannot be corrupt because they pay the media’s way. What the Spirit’s Johnson blew off was a chance to investigate how Columbia County’s cash infusion into his bank may have boosted Thigpen’s bank bonus. Had he pursued it he might have found the Talisman. From there an epic of financial gamesmanship might have been his prize! For the bank, Tarver had to do absolutely nothing to ward off scrutiny from investigators. All he had to do was sit in his office. Mr. Tarver is a fine man by all accounts and is respected but the simple fact is that he could be a cross between Nelson Mandela and Billy Graham and be the Talisman. Common sense says that one look at documents signed by Tarver or approved by his bank audit committee would make federal agents turn away. That is just how things are in the real world. The story almost sounds straight out of Washington DC and the recent news bombshells over the conflicts between the FBI and Department of Justice up there. In Columbia County’s banking controversy, the bankers are off enjoying their stock sale proceeds but the county finance department and the finance committee of the County Commission will now have to explain why they have been incompetent, or far worse. May be no Talisman for District One Commissioner Doug Duncan, who is running for the Chairmanship of the Columbia County Commission with the backing of those same bankers. He had the chance to investigate 3 years ago, shortly after taking his seat, but dropped the ball. 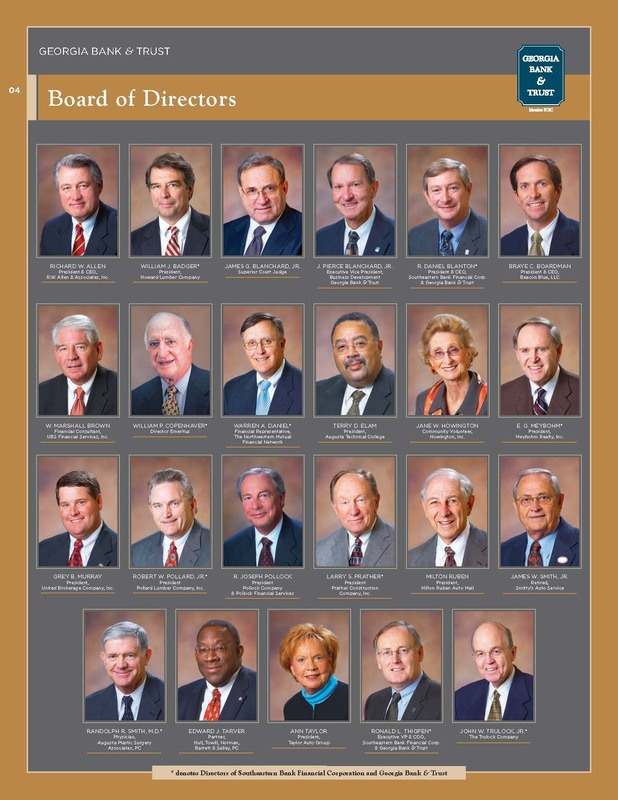 Former GB&T Chairman Robert Pollard, Former GB&T Chief Operating Officer Ron Thigpen, and Former GB&T Voting Board Member Larry Prather are listed as Duncan Supporters.Former GB&T shareholder and current Columbia County Commission Chairman Ron Cross, who voted for the suspect award of the county primary banking contract to GB&T, is said to be a Duncan contributor. Law enforcement on three levels of government has the greater responsibility of having turned a blind eye until the Statute of Limitations expired, possibly allowing financial thieves to escape prosecution. There are no Pulitzer Prizes that will be awarded to Augusta “journalists” from this scandal, either. The artwork was nice, though!